I wish I could write like that. So engaging. So persuasive. So full of personality. All writing gurus tell you: read a lot and write a lot, and you’ll become a better writer. But does that advice make you shake your head in frustration? Is your writing not improving fast enough? Perhaps you’d love to hire a coach or join a writing course. But what if that seems too expensive? Creating a swipe file is the learning method most pro writers use to improve their writing. They study other people’s content and create a collection with proven examples. Taking a course or hiring a coach is a faster way to improve your writing skills, but creating a swipe file is free, and it’s a good method for fine-tuning your skills. And I’ve written before how Picasso studied a 17th century painting by Diego Velázquez and created 44 new paintings based on that one painting. You don’t copy other people’s writing. You use their content to understand how to apply different writing techniques. Swiping is a legitimate method to improve your writing skills, and to become a more persuasive and engaging writer. What is a swipe file? A swipe file is a collection of writing examples. These examples can be anything from headlines to blog post openings, and from sales emails to landing pages. 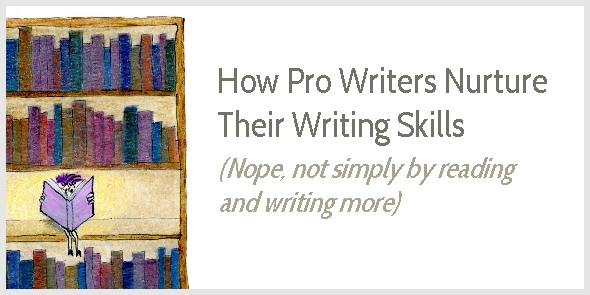 Pro writers use swipe files to inspire their content and improve their skills. Evernote is an excellent tool to set up a swipe file. Organize your swipe file with tags or categories, such as about pages, sales emails, landing pages, blog post openings, headlines, and metaphor examples. Add new content to your swipe file from your smartphone, tablet, or computer. How does a swipe file help improve your writing skills? A swipe file helps you understand writing techniques as you can see how others write. It also provides templates for your own writing. A swipe file can even help you overcome writer’s block and save time, as it provides suggestions for headlines, email subject lines, content structures, and more. The purpose of a swipe file is to study techniques and templates. Never use it to copy sentences or ideas word by word. To avoid plagiarizing, you may prefer studying texts outside your niche. To build a swipe file you have to stop reading and start analyzing content. The examples in your swipe file are only useful if you understand why a piece of content was written in a certain way. So, try to figure out why a piece of content is engaging or not, why content is persuasive or not, why content is inspirational or not. When does your mind wander off when reading? Why? What is the purpose of content? Looking for inspiration to write a web page? Study pages with a similar purpose. An about page, for instance, has a different purpose than a product description or home page. An about page highlights why your company is different from others; a product description should sell a product; and a home page should guide different visitors to the most relevant pages on your website. What is the purpose of this page? What action should the reader take? Is that action clear? What arguments are provided for taking that action? How are features and benefits communicated? How does the page build credibility and trust? Why do you believe the content? How is the information arranged? Is the most important information communicated first? And the least important information last? Want to get more opens and clicks? Start studying emails and add them to your swipe file. Why does the subject line entice you to open the email? Is all the information relevant or can the email be shortened? What is the first line? How does it engage you so you want to read on? How does the writer entice you to click through? Do they make you curious? Do they promise you’ll learn something? A blog post consists of several elements: a headline, an opening paragraph, subheads, the main body of the post, and a closing paragraph. You may want to study each of these elements separately. What is the big idea in the article? Which problem does it try to solve? How does the author try to persuade you to adopt his views or implement his advice? Does the structure of the article work? How would you improve it? When do you get bored while reading? Is this because of the writing style or unnecessary information? Why does the headline grab your attention? Why does it make you curious? Why does the opening paragraph pull you into the article? Or why doesn’t it? How does the closing paragraph inspire you? Or does the article fizzle out? Do the subheads make you read on? Why or why not? How have they integrated stories, metaphors, and examples in their writing? A swipe file can even help you understand the different elements that influence your writing voice. Does the writing have a pleasant rhythm? Are the sentences long or short? How do they vary in length? Is word choice formal or informal? Which emotional or sensory words are used? Developing your voice takes time. Don’t fuss about it. Instead, focus on creating content that resonates with your audience. The fun of learning a skill is that we can always get better. Whether we’re learning to write, dance, play the piano, or illustrate, we can experiment with our style. We can observe how others work and integrate their techniques into our work. We can play with different words. We can explore writing techniques. We can experiment. This is the beauty of creativity. I’ve read piles of books about copywriting. Books are useful to help understand writing techniques. But books are often not practical enough. So, complement your learning by studying content because this allows you to understand how techniques are applied in practice. This is the exact method I followed to become a better writer: First, understand the techniques by reading text books. Then, understand the practical application by studying real life content. Don’t try to study everything in one go. It’s overwhelming. Where do you think you can improve most? Which type of content is most important for your business now? Focus on one type of content at a time. Thank you Henneke. A light just came on. Great. Happy swiping and happy writing, Geraldine! What a great list of reminders of what to look for when analyzing what works and what doesn’t. Swiping is very common in sport to learn the finer details of the experts…watching skills, strategies and plays. And in many ways we internalize it better than when someone spoon feeds us with the information. Thanks for this! I don’t know why it keeps amazing me how many similarities exist between sports and writing. They’re both skills, so why do we think we need to re-invent the wheel? That’s what fascinates me about why people who are masters at one thing often excel in many areas. They keep taking and reapplying the same lessons. Curious people love learning and engage in trying to understand the concept behind the recipe. In today’s barrage of information, we tend to just skim and accumulate knowledge, instead of truly trying to learn. It’s knowledge hoarding. Knowing lots of stuff but never applying it. Yes, that’s such a good point. The internet encourages us to hop around without applying anything. There’s always a new shiny course or a new shiny book. My sincere thanks for Henneke for creating a must follow strategies. These are like sweet cookies loved by all kids. What do you think about the advice to copy ads / copy by hand daily? I’ve never copied writing by hand. Some people highly recommend it, but it somehow doesn’t suit me. Yes, yes, I use a swipe folder to collect Headlines, Creative Ads, Best Landing Pages, and Copywriting examples. Won’t you share your swipe file with your readers? I have been using swipe files for over a year, I came to know about the term “swipe files” a short while ago, though. I am so glad you presented an awesome tutorial to take my swipe files a notch higher. I think evernote web clipper is also very useful to get the exact section of a page you’d like to keep. Yes, I like the Evernote web clipper, too. I also use it to bookmark articles for research purposes. Evernote is an amazing tool – even the free version is great. The most popular advice on the internet as to how to master the act of writing is to “read a lot and write a lot”. It’s indeed a great advice per say but most times, it doesn’t really give you much. You’ll keep on making same mistakes over and over again. Reading and writing a lot can only enable you to get used to writing but often times, it won’t enhance your tone of writing. I’ve always come across fascinating words each time I’m reading a book or a blog post but, I’ve never thought of putting those into a swipe file, ” what a great mistake”. Recently, I was reading a book titled Think like a man, act like a lady and man, the words and sentences used on that book is mind blowing. I was even imagining how good they will sound in a blog post. I will put this in practice Henneke. Yes, well said, Theodore: How do you stop making the same mistakes over and over again? The best way is to hire a coach or take a course with personal feedback. But if that’s not an option, then reading text books in combination with creating a swipe file is a great option. I might consider getting a coach actually. Any suggestion on that? Do you offer coaching? I just joined the waiting list. Looking forward to September when it’ll be released. Thank you for the information. I never heard of a swipe file before. I will give it a try. Have a great day. Yes, give it a try. It has helped me a lot! Thank you, Heidi. I agree with you – it’s not about copying. Some people get upset by the idea of “swiping” because they think it’s plagiarizing, but as long as you swipe ethically, i.e. use your swipe to study techniques, formulas and templates, then it’s a great tool. My brain is growing more every Tuesday! Haha! I’m the same. I seem to have a seasonal pattern in using and updating my swipe file. When I make the effort, I always learn something new. A fresh burst of creativity as you say. Thank you for stopping by again, Cathy. I appreciate it. Great advice as always Henneke! I’ve set up swipe files but have to admit that getting to studying them is what misses in my ‘to-do-cycle’, I mean to do so but now have so much to get through that it’s disheartening. Thanks for a great reminder to get on this! Rather than trying to get through your whole swipe file, could you try to study just 3 or 4 relevant examples for the writing task you’re working on? I get quickly overwhelmed, so I often find it easier to study a limited number of examples. Happy writing, Mariken. Thank you for stopping by again. Wow, this is a super important post for any freelancer to see. Well done Henneke! I’m going to share this with my readers. Thank you for sharing and for stopping by, Jacob. I appreciate it! I’m so with you—I love collecting words, too! I like Evernote and now often file swipes and research right in my Trello notes for easy access and help with organization as well. Thank you for your kind words, Sue-Ann. Always grateful for your comments! Hello again Henneke, I think it comes down to the fact we innately know what we want to tell the reader but, when it comes to writing it down, words sometimes fail us. I do not have a swipe file, but I have a ‘structure file’ that ensures I tell the reader what I want them to know, then I tell them, and finally I tell them what I told them. My problem is I have a bad habit of wandering ‘off topic’ causing me hours of back tracking and editing to get to the point. I will give your swipe file advice a try – I trust your insight too much to ignore it. I hope you don’t get too much distracted with a swipe file when you want to write your book! It’s rainy in England today. Thank you for stopping by again, Paul. Aha. Now I get it. You build your own writing guide. Clever enough! Yep, that’s it. That’s a great way to phrase it. Haha, I need to come check it out sometime! I have heard about swipe files before, but never in this way. Most people advocate using them as templates. That is not much to my liking. I hate the steal-like-an-artist-philosophy when it’s interpreted like that. Wow! Amazing tips on improving writing skill. I have always admired other people’s work but never thought of creating such swipe file. But now, I’m surely going to make one. Hi Henneke. I know all of the most successful copywriters use swipe files. I remember when I was first learning how to build my website there were a lot of people trying to entice me to join their lists by offering free swipe files. It makes complete sense. I know that athletes watch videos of past events to analyze their performance and see how others perform. As a software developer I always kept examples of other peoples’ code from projects that I worked on so that I could learn how something was done. Excellent posts Henneke. Thanks for sharing. I’ve also seen people offering free swipe files. They can be useful, but I also like the process of creating your own swipe file; that in itself is a good learning process because it forces you to think what is good and what isn’t, which voice resonate with you and which don’t. I didn’t know software developers swiped code, too. But it’s of course also a good way to improve coding skills. Thank you for stopping by again, Ben! I have a swipe file for headlines why not writing. Understanding why they work is the hard part. That can be tough at times. I know where to go to study emails. My inbox, from you. They always make me want to click away. Nice. And I agree that it’s not always easy to understand why headlines (and other pieces of content) work. That’s why it’s useful to read text books to understand the theory of good writing. A nice class. In my field if photography and graphics, we say plagiarism is first form of admiration. I just hate to repeat what others do, but often take screen shots and put them in my “ideas folder.” Very often it’s pure art and not photography but it gives me ideas to start and expand in my own style. Naturally, I have a general idea when I start but most often the “me” surfaces and I get a happy result. I save on Google Keep. Its free. Wish they had folders. Yes, I like how you describe – how those screen shots give you inspiration to get started and how the “me” surfaces when you start to work. I don’t know Google Keep. You may want to check out Evernote – the basic version is free, too. You can use folders and / or tags. Great point about Evernote. I use it to grab entire web pages, highlighted portions of a web page, they let you grab an entire PDF. I even will forward an interesting email to the email address that Evernote gives you so you can email yourself data, files, etc. You can even select which folder it’ll go in by indicating such in the subject line of the email. On and on, it’s a fabulous tool for writers. And I cannot withhold myself from commenting on your drawing. I’m looking at the first two rows of books and I think to myself: “Oh, no seriously cute person in this drawing. What a bummer!” But alas, the third shelf reveals what we have all come to love. I know someone who subscribed to me snackable course using an Evernote email address, so they could keep all emails on file. I probably use only a tenth of what’s possible with Evernote. Perhaps even less! Thank you for stopping by again, Stan. A lot to learn in such less time! But if one is able to segregate inspiration, content, ideas and randomness it reduces the learning time. Thanks, Henneke. You’ve saved a damsel in distress. Swiping will also encourage me to focus, analyze and not feel lost after reading fiction. Due to limited leisure time, I’m overwhelmed to read fast and get to know the story (at the back of my mind other thoughts hit me hard, “You just have 6 hours to sleep, exercise, cook – stop reading fiction.”). After I finish the book I regret of not enjoying the writer’s storytelling style. Then I go back and re-read the underlined/marked sentences, and feel accomplished. I’m always happy to save a damsel in distress! I’m sorry to hear you’ve been feeling overwhelmed. I remember when I started to learn how to write, I lost the joy of reading. I couldn’t read anything without analyzing it. I now make a conscious effort to stop analyzing and enjoy my reading. Reading fiction has become a relaxing activity again. I could agree more with this. Especially with the swipe file part. I make it a habit to create specific google docs folders for this specific thing. The place it helps me the most though is emails. It helps me break down and decipher various patterns for emails that actually work. Great post on this and I’m a HUGE fan of swiping. Yes, I’m with you – it’s great to see how others write emails and see whether we can borrow a few ideas to improve our own emails, too. Isn’t it lovely when that happens? It’s funny, I was looking up how to create a swipe file 😉 and you came up. I truly enjoyed this post because of the questions (how to) of building a swipe file. You’ve provided so much great information here, it will be the first content added to my swipe file! Thanks so much!